Midland Texas dentist, Dr. Bell is passionate about informing all Midland residents that losing one or more of your teeth can cause a gap in your smile, which causes you to lose chewing functionality and the inability to eat a complete diet. Without the tooth to stimulate the jaw, the bone beneath it will begin to shrink in the same manner that muscle underneath a cast gets smaller. Since your facial bone supports the skin and muscle on top of it, missing teeth can cause your face to appear drawn in, sunken, and prematurely aged. The good news is that dental implants are an amazing solution from your Midland TX dentist, simulating a natural tooth and actually replacing the root of the missing tooth. The dental implant is secured in the bone, and functions as the root of your tooth by bonding naturally with the jawbone and preventing deterioration of the surrounding bone and preserving facial structure. Most dental implants can be cleaned by brushing and flossing in the just the same way as natural teeth. 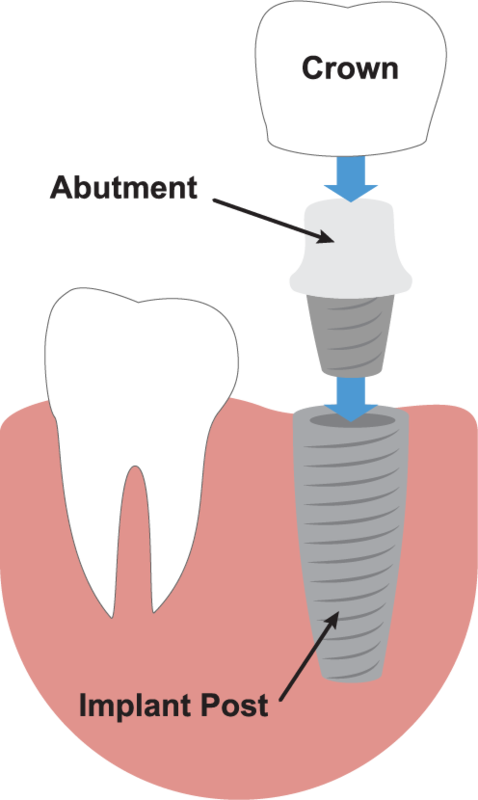 Once the dental implant has bonded to the bone, a dental restoration or dental crown can even be fitted over the implant, giving an appearance and function similar to the surrounding natural teeth. Dental implants have become the premier solution for people in Midland who have lost a tooth or multiple teeth. 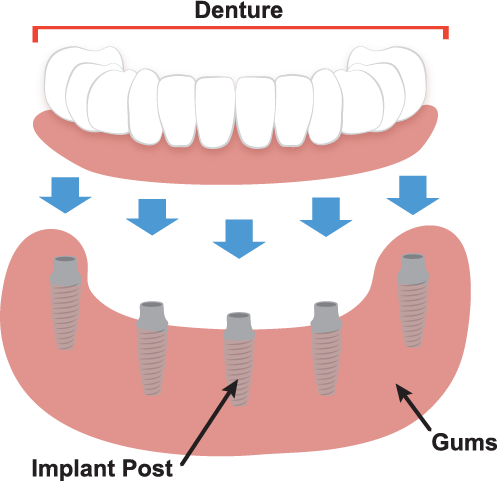 Now preferred over removable dentures or bridges, dental implants and implant supported dentures completely simulate natural teeth in both form and function, and are ultimately a replacement for the root of the missing tooth. Unlike removable dentures, implant supported dentures allow you to floss, chew, and smile normally again. Simultaneously the addition of an implant preserves facial structure and prevents deterioration of the surrounding bone. There are a variety of factors that our Midland Dentist team uses to determine if a patient is a candidate for tooth replacement with dental implant restorations. A certain amount of healthy bone is required in order to place implants. If you do not have enough bone density for traditional implants, we also offer mini implants which are smaller so they require less bone to place, and are often cheaper than traditional implants. Contact Dr. Bell’s Midland TX dental office today for an evaluation of your overall health and the health of your mouth to determine if you are a candidate for dental implants! If you have any questions about dental implants, or are ready to schedule a visit with your Midland dentist, Dr. Randell Bell at Health Centered Dentistry, give us a call today at 432-218-4389 or schedule online!